Take advantage of oceanfront privileges and only pay oceanview pricing! 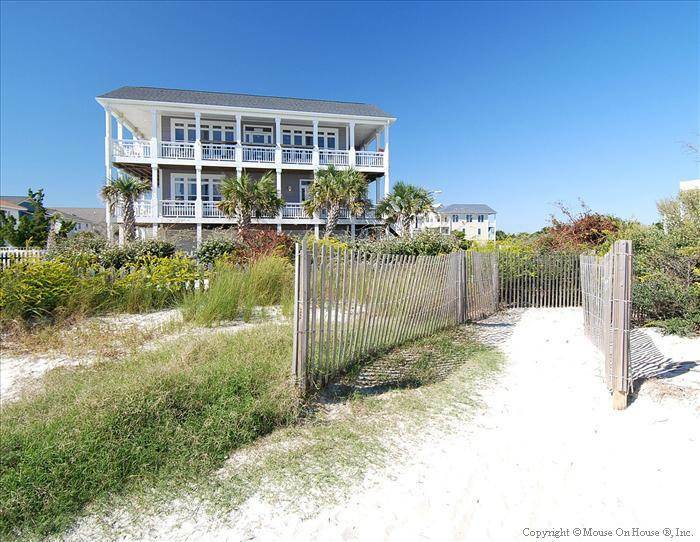 Watch your kids play on the beach or in your private pool while you lounge in a rocking chair on your deck. This luxurious home is located on the quiet east end of the island at the end of a private cul-de-sac, just steps to the adjacent beach access. Unbelievable panoramic ocean and inlet views! 4 bedroom, 4 bath home with all the extras including a private pool. Spacious living areas with well-appointed kitchen and dining area. Reverse floor plan, this home has 3 bedrooms, 3 bathrooms and a sitting area on the first floor. The master bedroom and bath are on the upper level with the living room, dining room and kitchen. Wireless internet & surround sound systems. Be a part of keyless entry in this progressive property. You have to see it to believe it! This home has it all! Sleeps 11. First floor bedding: Queen, Double, Double/Single bunk. Second floor bedding: Queen, full sleeper sofa. Large decks and covered porches with ocean and inlet views. Hot and cold outside shower. Dishwasher, microwave, washer/dryer, main TV is 40" with HD programming, additional 27" TV in master bedroom and second living room, remaining 3 bedrooms all have TVs, and DVDs throughout. Even an Xbox for the Kids! Non-Smoking. Bed linens and 11 towel sets provided. I have rented several different houses at different NC and SC beaches. This is absolutely my favorite. The panoramic view of the ocean from the kitchen/dining/sitting room is amazing with a full wall of windows. The many decks, pool area and all the outside space is wonderful. The bedrooms are cozy and decorated so beautifully. The location to the beach and the end of the island is so nice for shelling and walks. House is great, location is absolutely magnificent. Enjoyed the short steps to the beach. The view from the upstairs is panoramic, great to drink coffee and watch the waves. Curtains on the street side bedrooms need to be changed, they are gapped about 6 so privacy is questionable but we would definitely rent again, just take an extra sheet to hang over the window.